Author: Callaghan, Morley Set In . . . Description: It was the fabulous summer of 1929 when the literary capital of North America moved to La Rive Gauche--the Left Bank of the Seine River--in Paris. Ernest Hemingway was reading proofs of "A Farewell to Arms," and a few blocks away F. Scott Fitzgerald was struggling with "Tender Is the Night." 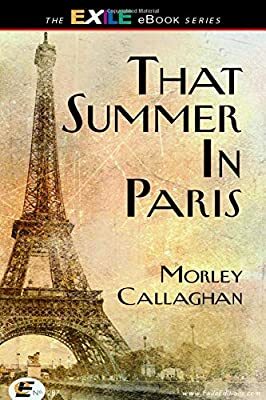 As his first published book rose to fame in New York, Morley Callaghan arrived in Paris to share the felicities of literary life, not just with his two friends, Hemingway and Fitzgerald, but also with fellow writers James Joyce, Ford Madox Ford, and Robert McAlmon. Amidst these tangled relations, some friendships flourished while others failed. This tragic and unforgettable story comes to vivid life in Callaghan's lucid, compassionate prose.